What Does the Bible Say about the Ten Commandments? Take a stand against abortion! Use these signs in demonstrations or simply put one in your yard. These signs are made of durable chloroplast, guaranteed to last the outside weather at least three years, planted firmly in the ground by an H-shaped steel wire stand. A picture on an abortion aborted baby on a yard signs makes a profound impact. To order, e-mail us at , or call 941-451-4113. Wire stands are an additional $.70 each. 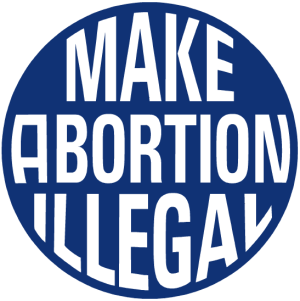 "Make Abortion Illegal" signs, 23 or 17 inches round. Shipping and handling costs are $5, plus 70 cents per sign (2 to 24) or 50 cents a sign (25 to 49), or 40 cents a sign (50 to 99), or on 100 or more. Currently out of stock call before ordering. Currently out of stock. Please Email us and let us know if you are interested in ordering some. Will NATIONAL LIFE CHAIN SUNDAY Include Your City? Over 1,000 cities and towns across North America were involved in Life Chain last year, and on October 5 prolifers will have another opportunity to build a powerful local witness for God to anoint and use to save the lives of local boys and girls. Will unborn children in your city have Life Chain protection? Only 53 life defenders standing 100 feet apart can build a mile-long Life Chain. Imagine 500 prolifers building a Chain 10 miles long! And the cost is very low, about 25 cents per person, to be covered by freewill donations. What are the benefits of promoting the Life Chain? 3. Over a million people each year will participate in a Life Chain. Millions more will see a Life Chain or will see an article about it in a newspaper or other news media. The Life Chain prolife message has touched the majority of Americans. 4. Most of the organizers of Life Chains, are actively involved in crisis pregnancy center or a state or local pro-life organization. A major indirect result is as a result of the church contacts and participation, the Life Chain has become an active recruiting tool for local and state pro-Life organizations. Many volunteers for the crisis pregnancy centers and new members of many pro-life organizations have been recruited through the Life Chain. 5. Life Chain has contributed to the growth of many Pro-Life organizations and has made millions aware of the abortion problem. 6. The new Pro-Life yard signs will continue the Pro-Life message all year long. Just one well placed yard sign can effect thousands of people each day. A few yard signs will effect thousands of people every day, and will have a lasting effect on your community. Only God knows how many people this witness will touch one about to have an abortion. 7. Against Abortion, Abortion Facts, a Pro Life witness to your community. Reward for keeping the 10 commandments. King Charles II gave him land in America in payment of a debt owed to his father. As he had been a Quaker imprisoned in the Tower of London, he invited persecuted Christians of Europe to join his colony of religious toleration. Soon Quaker, Mennonite, Lutheran, Reformed, Scotch-Irish Presyterians, Dunkers (German Baptist), Brethren, Schwenckfelders, French Huguenots, etc., joined his "holy experiment." 6 And Solomon said: “You have shown great mercy to Your servant David my father, because he walked before You in truth, in righteousness, and in uprightness of heart with You; You have continued this great kindness for him, and You have given him a son to sit on his throne, as it is this day.